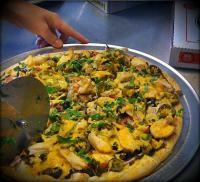 What To Do > Colorado > Breckenridge Summit County > Restaurants > Extreme Pizza - Delicious Pizza: Dine-In or Delivery! Gourmet pizzas (fresh or take-n-bake), sandwiches, fresh salads, and killer wings with ontime, hot delivery, pick up or restaurant dining. Extreme Pizza uses only the freshest ingredients, the tastiest combinations of toppings, and a mouth-watering restaurant-baked or gluten-free crust. Whether you eat at Extreme, have a piping hot pie delivered to your doorstep, or try one of the "take-n-bake" pizzas that you cook at home, gear up for an eating adventure! Are you ready to get extreme? Dining - Delicious Pizza: Dine-In or Delivery!